Caring for babies can sometimes come difficult to young kids, especially ones that are becoming big brothers or sisters for the first time. It’s not that they are incapable of caring, it’s just that empathy is a complex skill to develop. Helping your kids to develop a sense of caregiving is Big Baby, an app from Australian developer Big Ice Cream. Designed by real moms, the app provides an open-ended roleplaying game in which kids learn to take care of virtual babies. The app comes with a selection of four babies: George, Rose, Asher, and Bo. Kids select one that they would like to care for by tapping on the baby’s photo. Upon entering the game mode, kids can select any of nine activities to do with the babies. These include changing the baby’s clothes and diaper (or “nappy” in the app), feeding them, giving them with milk, showering them with love, covering them with a blanket, and giving them musical toys. A neat thing about the app is that some activities can be quite realistic. For example, when a baby overeats, he/she will soil his/her diaper and thus, need a diaper change. To do so, kids must first tap on the tabs of the diaper to open it. They then slide away the dirty diaper, complete with poo inside, and throw it away. Once the soiled diaper is removed, kids can then put on a fresh new diaper on the baby. It is possible to put on some diaper cream first, although strangely the cream always lands on the baby’s torso instead of his/her bottom. During feeding, it should be noted that each baby has his/her own preferences. For example, baby George doesn’t like strawberries and nigiri sushi, so he won’t eat when you give him these foods. Baby Asher, on the other hand, won’t eat watermelon and dumplings. An interesting feature is that kids may also feed the babies with pureed food in addition to solid ones. A selection of realistic food items is available, including fish and several vegetables. Kids may drag as many as they like into the blender, and blend at two different speeds. Once the baby is properly fed and cleaned, kids may tuck him/her into bed. The baby will immediately fall asleep when covered with a blanket, regardless of the time. He/she will even snore! The baby is a pretty sound sleeper, and the only way to wake him/her up is to remove the blanket. Finally, kids may also entertain their baby with toys. There is a musical owl which plays Twinkle, Twinkle Little Star when touched, as well as a jack-in-the-box with a surprise inside. The baby does not actually interact with either toys, however -- the baby only laughs when the owl is near, but won’t hold it, and the jack-in-the-box is played in a separate screen. Cute, simple, and intuitive, Big Baby is a nice app that helps kids develop a sense of caregiving and empathy, especially towards babies. This rule-free app is suitable for kids ages 3–6. It is useful when you are expecting an addition to your family, and you want your other kids to prepare themselves to become brothers/sisters. It also makes a great app for kids who just enjoy playing with dolls. The app is intuitive and easy enough for young kids to navigate on their own. There are no ads and in-app purchases, so the app is quite safe. There is a special section for parents which provides tips for maximizing the app, however it is password protected. Other than the activities already described above, Big Baby also comes with a simple picture book, which provides some information about the babies. The book does not include a narration though, so non-readers will need assistance from their parents. Additionally, there is a crafts section where kids can print out (via AirPrint) or email paper doll templates for each baby. A clean template is also included, which allows kids to draw their own babies. 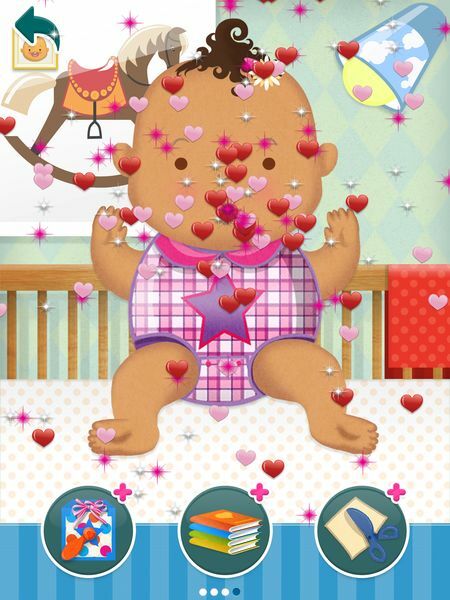 Big Baby is an adorable app! I love how expressive the babies are. They giggle when you tickle their hands and feed, and put on an annoyed look when you poke them in the face. They also look uncomfortable when their diaper is dirty, which prompts you to clean them up as soon as possible. I also like that the activities are made realistic, like how the babies cry if you take away their bottle before they finish drinking it. The diaper change is also a nice activity. I was a bit taken aback by the “surprise” during my first diaper change, but it does make the experience more realistic, and I think kids will get a kick out of it. My only complaint with the app is that sometimes, while swiping to pick an activity, I would accidentally select one. I think it would help if the icons were a tad smaller, or if there were arrow buttons. It would also be nice if there were more food choices, as well as toys for the babies to play with. But otherwise, overall the app is pretty good. 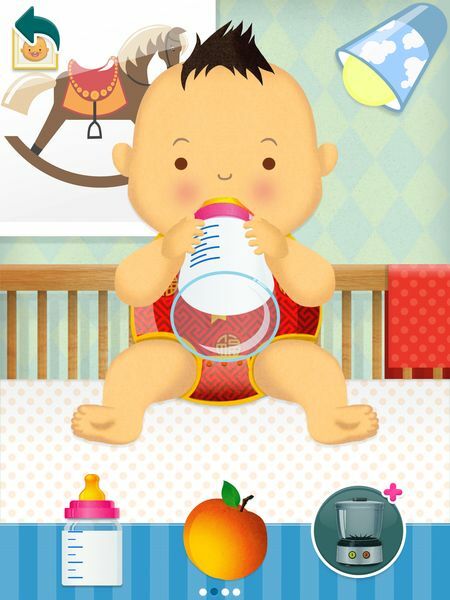 Big Baby is a cute roleplaying app that shows kids what’s it like to take care of babies. The open-ended app is pretty realistic, with the babies expressing different emotions as they respond to what the players do. It makes a great app for kids who love playing pretend with dolls, and also a teaching tool for new big brothers or sisters.